Sleek, classy, elegant and handy, the Alpha scores high on design, says Vipul Vivek. Samsung's Galaxy Alpha left me in a bind: The phone is not another offering from Samsung to make captive users at every point possible in the price range. The company has priced the Alpha high and ensured that the design and functions don't make users feel shortchanged. 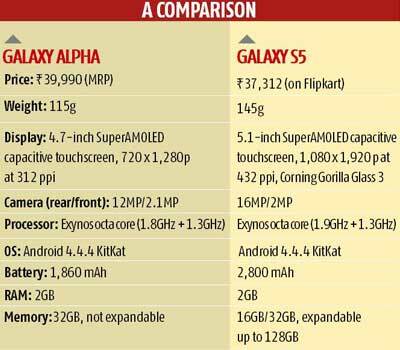 The Alpha might lack a few features of the S5 or the Note series. Even so, it is every inch a flagship, or at least it claims to be branded as one. But that confuses me as a buyer: If the choices aren't clear enough, it is vexing to decide which one exactly is a flagship. A little difference in price at the higher end spoils the flagship branding. Sleek, classy, elegant - despite looking iPhone-ish - and handy, the Alpha scores high on design. It's easy to use with one hand and fits snugly in the palm. The svelte body curves a little from the metal rim on the plasticky back, which is the only disappointing part as far as design goes. The shiny, square-ish metal rim curves towards the edges. The top edge of the rim houses the 3.5-mm headphone jack, the bottom the charging port and the speaker grille, the right the sleep key, and the left the volume rocker. There are two microphones (one, to detect ambient noise), one on the top edge and the other at the bottom. On the top of the back cover are the 12MP camera, the LED flash and the heart-rate sensor. The sensor, used with the S Health app, showed my beats varied between 117 and 139 a minute during several tests in a gap of a few seconds. Just days ago when I checked it at the launch of the Note 4 it was in the 72-76 a minute range. Below the screen are the recent app tray and the back key; on the top is an LED on the left that alerts you about notifications. The Alpha has the fingerprint scanner like the S5. The scanner is neither accurate nor very responsive, but we hope it gets better in its next iterations. The super AMOLED high-definition display is vivid and vibrant as usual. 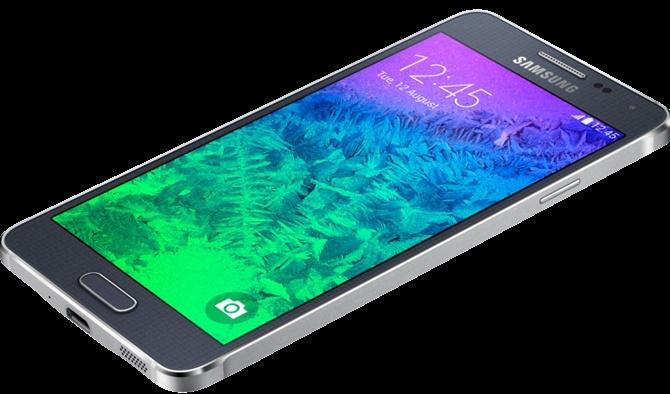 It lags behind the flagship S5 only in size and the pixels but that isn't really a spoiler. The colours are rich and sharp, only possible in an AMOLED display. 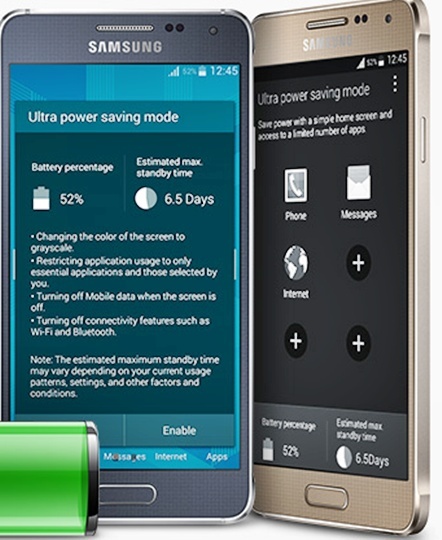 The resolution is a notch below the S5 but that also means less battery use. 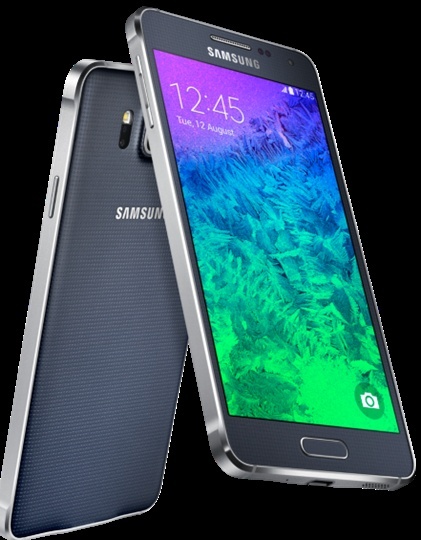 The Alpha runs on an octa-core Exynos processor with clock speeds of 1.8GHz and 1.3GHz for the quad-core pairs. The graphics processor is a Mali-T628 while the S5 uses an Adreno 330. The Alpha is snappy and moving between functions is no hassle. The RAM, like the S5, is 2GB. It got a high score of 48,350 on the AnTuTu benchmark. The 12MP rear camera is less than what you get in the S5, and comes with autofocus and various modes such as selective focus, ultra high-definition recording and dual camera that lets you use both the cameras simultaneously. We felt the front 2.1MP camera clicked better shots for its ability than the rear one, which lacked deep detailing and with which snaps came out a bit grainy. The Alpha has a 32GB memory of which about 26GB is available for use. 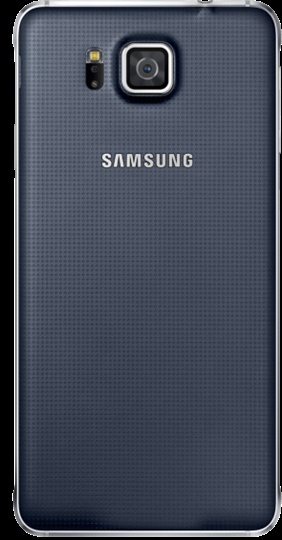 There's a talk of a 64GB version later but there's no expandable memory right now, unlike the S5 which takes an SD card of up to 128GB. However, the greatest setback the Alpha suffers from is the battery. At 1,860 mAh against the S5's 2,800 mAh (which isn't also great), one might struggle to get through the day with the Alpha, if one is a heavy user. At about Rs 40,000, it might be targeting iPhone users. Otherwise, buy it for its design and compact form factor. 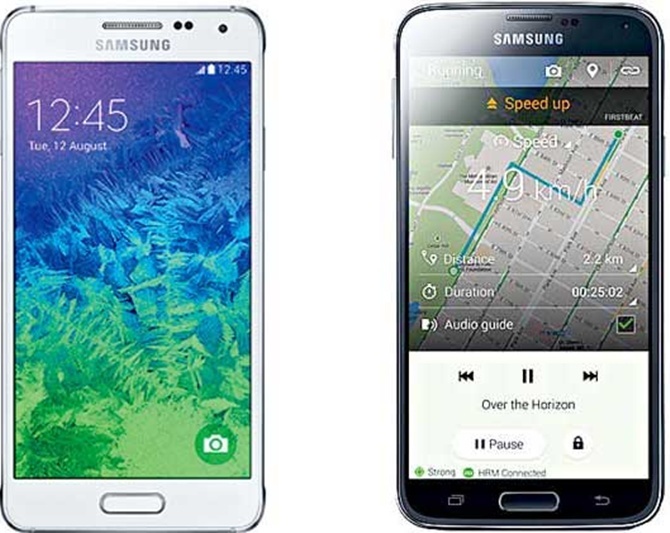 Smartphone wars: Will Google's Android One dethrone Samsung?